For those that missed the 2005 Reunion in Arlington, VA - it was quite a reunion. Its been said that everyone should visit the nation's capital at least once in their life time .. 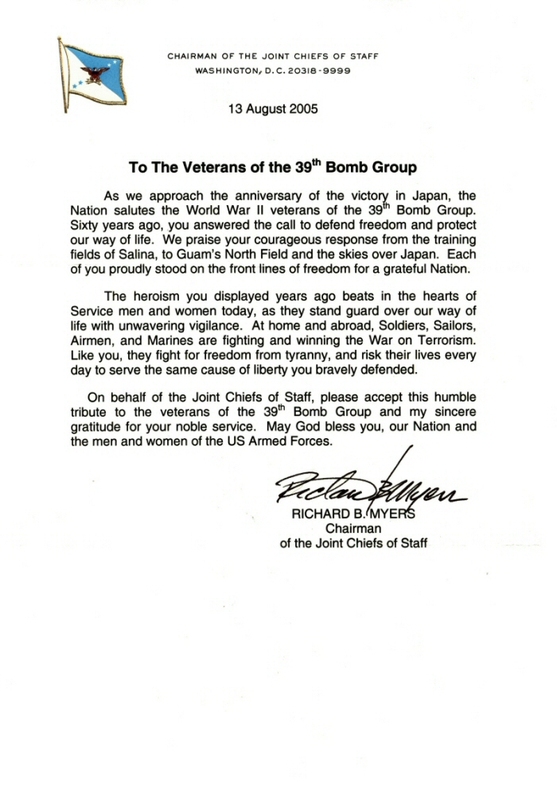 I was honored to be able to attend with the great men of the 39th Bomb Group (VH) and their families. One of the highlights of the weekend was the Saturday evening banquet. The veterans and their families were entertained by the USAF Brass Quintet; The USAF Color Guard presented the Colors .. Victor Durrance (tail gunner Crew 21) and his wife Dorothy arranged a guest speak - Major Mark Resnake, USAF - who served with the 960th AACS (AWACS) Squadron - the 960th Squadron traces it's linage back to the 39th Bomb Group - so the veterans were able to hear about the squadron's accomplishments and know that a part of the 39th BG is still on guard today flying missions.. as it was in 1945. 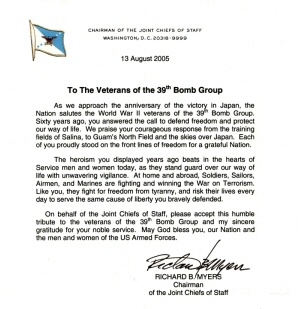 The veterans were also honored with a presentation of a letter from General Richard B. Myers, Chairman of the Joint Chiefs of Staff. 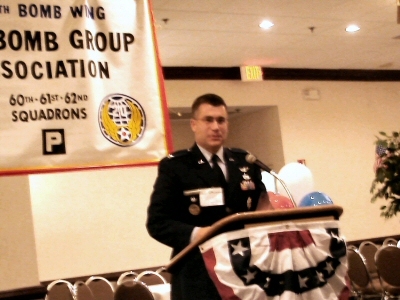 The letter was presented by Colonel Michael R. Dickey, USAF, Special Assistant to the Chairman, Joint Chiefs of Staff. Colonel Dickey and his sister, Jennifer Cotturone are tied to the 39th Bomb Group (VH) by their grandfather, Sgt Howard V. Dickey, who served 61st Bomb Squadron as a camera technician.